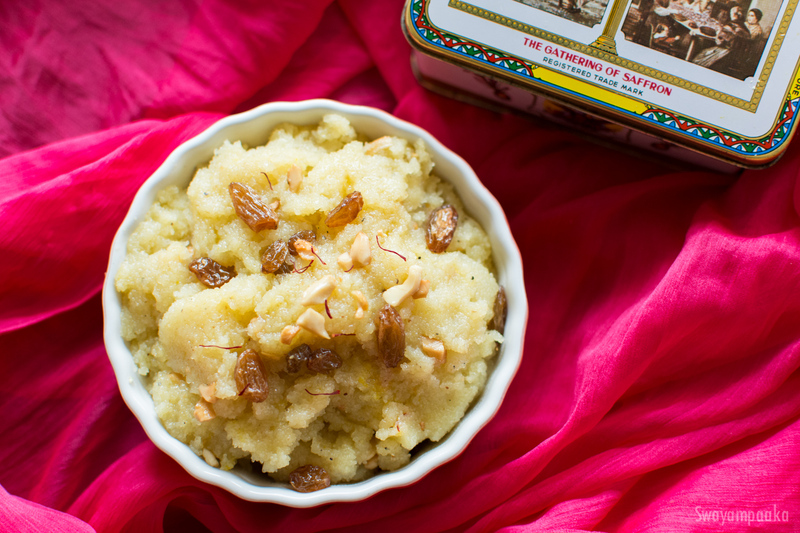 The most popular south indian festival sweet is Kesari bath or sooji halwa. This dessert is perfect for festival days or just to quench the sweet cravings! With the touch of cardamom and natural color and cooling effect from the saffron makes it more festive and delicious sweet.It is common to relish kesari bath with khara bath/uppittu , popularly called chow-chow bath. This combination dish can be prepared in 30 minutes( yes , both sweet and khara), good for sudden unexpected guests. You can put the kesari bath on a greased plate and spread it and cut into desired shapes, it will be semolina cake, best for the parties and get together. Heat 2 tsp ghee in a pan on medium heat, fry cashews and raisins until the raisins puffs up and nuts turn golden brown, transfer it to a plate. Keep it ready. Dry roast the rava until the raw smell disappears and turns light golden brown. Transfer the roasted Rava to a plate. Boil the water in a pan, once it starts to boil reduce the heat to low and add ½ tbsp ghee. Now add the roasted rava slowly, stirring continuously. Cover it and cook it on low flame for a minute. Amazing!! Looking so delicious. Thank you so much for sharing with us.